With its six adjustable pole pieces and dual magnet design, the new Jaguar Sized P90 pickup is great if you're after that fat single coil P90 sound. Due to its design of dual bar magnets and pole screws, the sound is warmer & fatter than a standard Jaguar pickup. In the middle position you'll stil get the classic crunchier sound, just a fatter, more rounded version. Great for a more attacking, grittier style of playing. As the geometry of the Jag-90 pickup differs from a standard P90 in terms of width of coil, the sound will be a little brighter but still with the warmth and fatter single coil voice you'd expect from a P90 design. I've designed the P90 Jaguar pickup with custom magnets to let the strings vibrate a little more adding to the warmth in the sound. The adjustable poles allow you to match the your neck radius for better string balance. 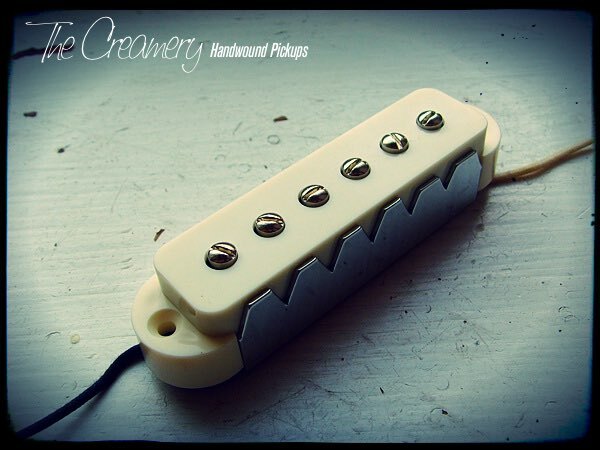 The Bridge can made with regular Alnico 5 magnets or a thicker/stronger set for a much fuller sound - Due to the taller nature of this option, the cavity shielding ground lug (in MIM & Squier Jags) usually found screwed into the wood underneath the pickup would need to be re-positioned just a little further away in the wire channel. Its a very simple process, just unscrewing and re-screwing - simple as that. I've custom designed the bobbins so the pickups will fit standard Jaguar pickup covers and the Neck Jaguar P90 Pickup can be RW/RP for hum cancelling in the middle position.